The solution is really easy to stress test the graphics card on all Windows OS! Caution Be careful when overloading the graphics card! The program should not be underestimated because of the under 100K size, some of the graphics cards are charged more than in 3D games that it is partly written in ASM (machine code). 1.) ... Enable the GPU / Graphics Stress Test for Windows! 2.) ... See the load balancing / load GPU on the new Windows 10 Redstone! 3.) ... What should I consider during the load test of the graphics card? See also: ► How can I stop the computer load test on my Windows PC? 1.) Enable the GPU / Graphics Stress Test for Windows! Please use always the latest version of the pc stress test. ... StressMyPC! (Image-1) stress test, load only the graphics card! 2.) See the load balancing / load GPU on the new Windows 10 Redstone! These handy features have been added to Windows 10 Creators Update , also known as Windows 10 Version 1709. If you are using Windows 7, 8, or an older version of Windows 10, these tools will not appear in your Task Manager. 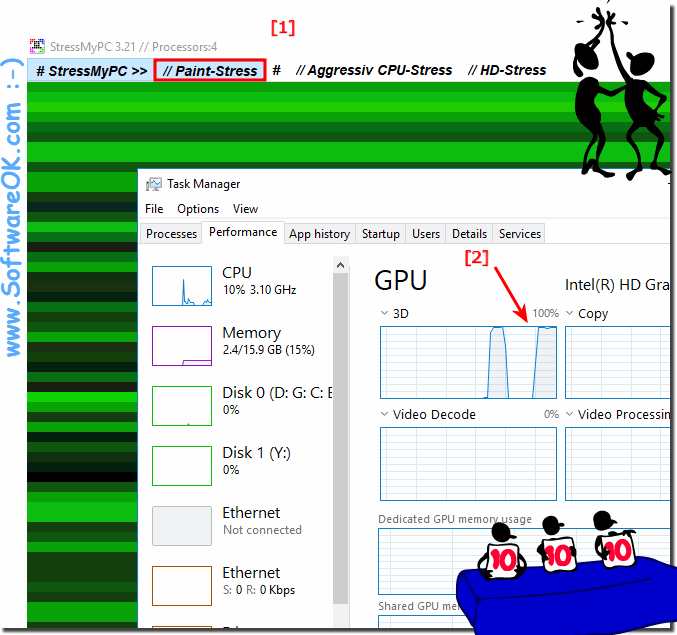 Launch StressMyPC and in the Windows Task Manager, click on the Performance tab and look for the GPU option in the sidebar to monitor the overall usage statistics for the GPU resources. You may need to scroll down to see them. (Image-2) GPU load at 100 percent on Windows 10 graphics card! 3.) What should I consider during the load test of the graphics card? Before you start, I have to warn the users of StressMyPC about the dangers of stress tests. The software is small but can not only generate a full graphics load, but may also go beyond the performance limits defined by the manufacturer. The use of these so-called can cause damage to the system, especially if used for a long time. For completely new hardware, there is a protection mechanism that shuts down the hardware in good time, as a rule, graphics cards are built as of 2010! Those who want to use these applications take all responsibility for the result. Be sure to continuously monitor relevant parameters, including temperatures, with accurate and up-to-date utilities. At least you can stop your tests immediately if it is necessary. 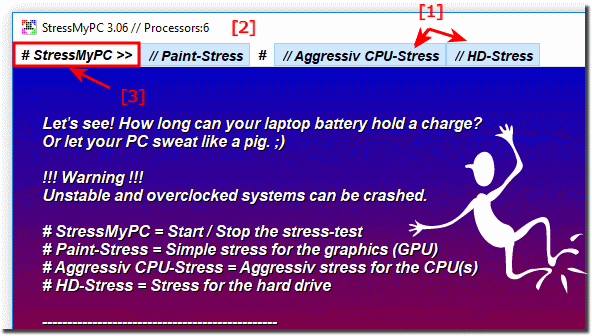 StressMyPC - FAQ-4: With the stress test, load only the graphics card, how to?